Earlier today I shared a classic training montage on my Facebook page. In case you missed it, the video was from the 1985 film Rocky IV. I still recall watching the film in the theater when it first came out. Thirty years later, the training footage remains as inspirational today as it was when I first saw it. And while some may argue that Rocky was a fictional character, I’m not ashamed to admit that the early films inspired many of my own outdoor workouts (ex. see here). I’m not the only person to be inspired by an old Rocky film or soundtrack. In fact, today is not the first time I’ve shared a Rocky montage. Whenever I do, it goes without fail that hundreds of people either like or share the video. There’s just something about the old Rocky films that get the blood flowing. Ironically, 1985 didn’t just offer fistic inspiration via Rocky Balboa. That same year provided fight fans with one of the most legendary bouts in the history of combat sports. On April 15th, 1985, Marvin Hagler and Thomas Hearns went to war in what will always be remembered as a classic. And similar to Rocky IV, the Hagler-Hearns bout remains just as inspiring today as it was when it first happened. It doesn’t matter that I’ve studied the bout so many times that I have memorized the commentary and sequence of punches. It is always exciting to watch two tremendously skilled and conditioned warriors battle it out. We don’t need Captain Obvious to remind us that Rocky IV and Hagler-Hearns remain inspiring. Fortunately, there is another point to this entry. To put it bluntly, what worked thirty years ago still works today. Fighters such as Thomas Hearns and Marvin Hagler could compete in any era. In other words, what they were doing thirty years ago would still work today. And if these men could get into top condition without modern technology, so can you. Regardless of the so-called advancements that are touted by today’s industry, there are certain qualities that cannot be manufactured by anyone but yourself. At some point, your success (or lack of) is not going to be based on the equipment you have or the facilities you use. What matters more is how hard you are willing to work with whatever you have. 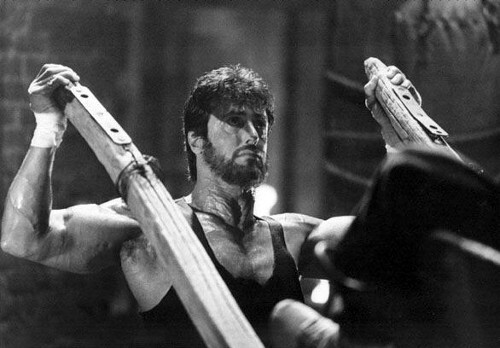 Rocky IV may have been a movie but that doesn’t negate the effectiveness of the training style filmed throughout. Anyone who suggests otherwise has never worked in such an environment. Personally, I probably spent more time training outdoors last year than I have any other year. Yet despite planning less and working in as crude of an environment as ever, I can honestly say that I performed some of the best and most challenging workouts of my life. In summary, more people need to be made aware of the exercise potential that exists in the world around us. So many individuals live under the false assumption that they do not have what they need to advance and improve. Hopefully, looking back to a classic bout such as Hagler-Hearns or a film such as Rocky IV can awaken these people to the idea that modern technology is everything but a necessity. Thirty years is literally a blink of an eye when considering human evolution. Don’t be fooled to believe that effective methods from the past have somehow expired. More often than not, the old school methods remain as relevant and effective as ever. Rocky might be fictional, but his training is based on the great Russian wrestler Aleksandr Karelin – 3 gold medals and one (controversial loss in final!) silver at the olympics. Old school works in the real world, as Ross has pointed out and personally demonstrated countless times. In 1999 I took in camp with Dr. Mel Siff – co-author of Supertraining. He showed a picture of Verkhoshanskey’s gym in Moscow. It was old, small and full of boxes, kettlebells and plates. One old universal machine (typical of one of our highschools) was stuffed in a corner so that half the stations couldn’t be used. Mel compared the facility to a 3-level gleaming chrome ultra-modern training facility – I think it was in Denver, but doesn’t really matter. There was one other difference. Verkhoshanskey’s gym had a wall of fame. To get on the wall you had to win a gold medal in the olympics. Not a silver. Not a world championship or set a world record. Gold medal – Olympic games. Going by memory here, but as I recall there were over 250 members of the wall of fame. And let’s not mince words here. Hearns and Hagler would rule the modern era. Hagler would give the likes of Golovkin a boxing lesson and Hearns woud be a stylistic nightmare for any of the current welterweights and light middleweights (including Floyd and Pacquiao). Didn’t know that fight before. What do you think about the Ward vs. Gatti Triology? Old school works for sure, just look at the Parachute Regiment training (P-company)… I’m sure in the USA your military still utilise the old school approach. Throughout the world boxers are still using whatever works, martial artists too. Ross has given us many inspirational video and articles over the years showing such people at work. The fitness industry is there to look after itself and make money, there’s no money to be made from people who have true grit and the determination to put in the miles and do the hard work. The internet certainly allows keyboard jockeys to baffle brains with their technological BS. The majority of folks want to take the easy option and therefore lack a warrior spirit. Keep it old school and read and learn about the old athletes. Rocky Marciano’s one of biggest inspirations ever since I first read about him, in fact that wasn’t too long after I first saw Rocky 4 at the cinema. What’s a solid way for beginners to do this?